Australia, 1990, 95 minutes. Colour. Eri Ishida, Nicholas Eadie, Chris Haywood, Tim Robertson, Julie Forsyth. 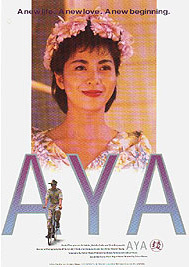 Aya is a film about a young Japanese war bride. She migrates to Victoria during the 1950s. Her husband is sympathetic, although he finds it hard to deal with his ocker presuppositions, especially in relating to an Asian woman, her customs and manners. She befriends an older man, Mac, who is more sympathetic to Japanese culture. The film offers episodes over a period of twenty years. Aya marries, works with her husband, bears him a son, Ken. She works in a restaurant, has an affair, finally leaves her husband. Eri Ishida gives a fine performance as Aya, tracing her life and experiences over the twenty years. Nicholas Eadie is strong as her husband, Chris Haywood as her friend. In the later part of the film, Aya relies on her son, whom his father did not want to be bilingual, to relish the Japanese traditions that were part of her personality. The film was written by Solrun Hoaas, who lived some years in Japan, came to Australia and taught, doing a doctoral thesis in Asian studies, and began to make films. She died in 2009. 1. A film about Australia and Australian sensitivities? Japanese (**?Japan?) and Japanese sensibilities? A film about women? 2. The Victorian and Melbourne settings, the period? The musical score, the songs? The evocation of both Australia and Japan? 3. The structure of the screenplay, the time span, the creation of the period, the linkings? The episodes? Action off screen? Action in crises? The audience given enough on screen to understand Aya, her character, the issues? The audience having to supply? 4. The portrait of Aya, subjective, memories? The photos, the letters, the voice-over? Her experience, coming to Australia, her age? A woman from Japan? Women in Australia? Her love for her husband, the quality of the marriage? Her isolation, wandering the beach, going to the fair, the Japanese tea ceremony, the Ford? People welcoming her? The sexual relationship? Mac as a friend? Ken and his birth? 5. The director’s perception of women’s experience, Japan and culture, isolation and the prospect of never returning to Japan, food, customs, language? Barry and his wife? Managing? Cheerful? 6. Aya and her relationships, ordinary, tense? The accident and the aftermath? The alienation? The possibilities for her, the jobs? The effect on her? Her son? The sense of being alone? Her work as a translator? Hobart, the violence, yet managing? 7. Mac, his character, his friendship? The restaurant and the young man? The issue of abortion? Mac’s friend? The effect on her life? 8. The portrait of Frank, the Australian background, in love with Aya, the marriage, his showing Australian prejudice, the issue of language? Tina and the marriage? 9. Mac and his life, friends, work, the government, meals, the abortion? Hobart? The friendship? The end? 10. Barry, his wife, success – and the pay envelope? 11. Ken, his childhood, growing up, his relationship with his father, with his mother, helping his mother? 12. The effect of life over the twenty years on Aya? Where she stood at the end of the film? 13. The film as an opportunity for audiences to understand Asians in Australia? The meeting of cultures? The war history? The need for Australian openness, drawing on Australian traditions but learning about other traditions?